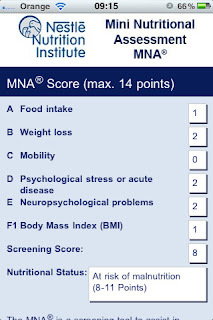 MNA is a free nutritional screening app developed for Nestle. This app is easy to use, and uses the validated Mini Nutritional Assessment (MNA) tool to assess the risk of malnutrition in patients. MNA is easy to use, and has an option to save patient information for later review. MNA suffers from an uninspiring user interface and a requirement to enter a patient name to start the screening tool. However, MNA is the only malnutrition screening tool in the iTunes app store at this time. Malnutrition is a common, though unrecognized problem. Adding MNA to your app collection may help you identify patients at risk of malnutrition.